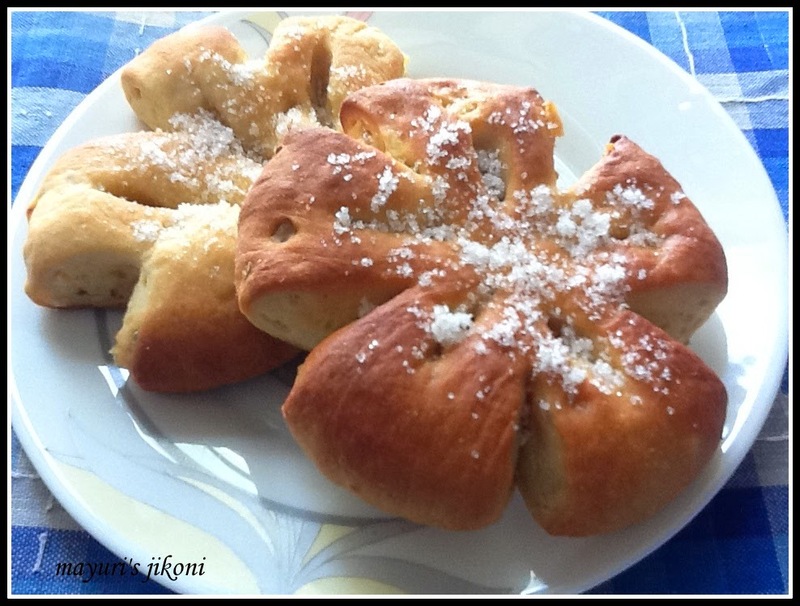 The July challenge from the we knead to bake group was Gibassier (pronounced as zee-bah-see-ay). This aromatic, delicious, rich, breakfast bread or pastry hails from the Lourmarin village in the Provence region of France. It is usually flavoured with candied orange peel, orange zest, orange blossom water and anise seeds (fennel seeds). It is brushed with clarified butter and sprinkled with caster sugar. It is believed that the doughnut like bread or pastry got its name from the mountain Le Gibas that can be seen in the horizon of the village. For more information about this delicious bread or cookie as some in France call it visit Aparna’s blog, My Diverse Kitchen. I was doing more research on the bread on the internet and hubby dear comes to see what has got me so engrossed. He saw the photos and asked, do they have a special machine to shape this bread, it looks so beautiful. Its really heartening to know my hubby is taking a keen interest in what I am doing especially when he knows that I love baking. He encourages me in every step that I take to better my life. When I made the bread and he saw the shapes of the gibassier, he was like a little kid, couldn’t make up his mind which one to try first. He loved the flavours. I am also grateful that my kaki had sometime back given me a bottle of the orange blossom water. Never had heard about it till she gave it to me. I did a bit of research and came to conclusion that it is widely used in the Arabian desserts. I was surprised to read that it is popular also in other regions of the world. While baking the bread, the whole house was filled with the aroma of orange and anise seeds. The bread can be made with a lot of variations where the slits and cuts are concerned. It was easier making the cuts with a sharp pair of kitchen scissors and the slits were easy to make with a plastic spatula. I made an eggless version and with eggs.Both turned out well. Mix the flour, milk and yeast into a dough. It should be smooth and not hard. If need be add a little bit more milk. Cover the dough and leave it in a warm place to ferment for 14 to 16 hours. Its best to make the pre ferment the previous night. Put the flour in a big bowl. Add sugar, salt, anise seeds, orange zest and yeast. Mix well. In another bowl whisk lightly the eggs or milk, orange blossom water, olive oil and warm orange juice. Yes, its important to warm up the juice if you are using it. Tear the biga into smaller pieces. Add all of it to the flour and mix gently. Add the liquid and knead into a dough. Add the cold butter little by little as you knead the dough. I kneaded the dough for 10 minutes till it was smooth. Add the candied orange peel and knead it into the dough. Shape it into a big round ball. Oil the big bowl lightly. Place the dough in the bowl. Cover it or wrap a cling film. Leave it in a warm place till it becomes double the size. Mine took about 2 hours. Gently knead down the dough using your knuckles. Divide the dough into 12 parts and roll it into a ball. They should be about the size of a golf ball. Line the baking trays with parchment paper or lightly butter it. Now the exciting part, to shape the gibassier. Take one ball and using your hands spread it into an oval shape. Can use a rolling pin if you like. Using a spatula, make a slit in the middle and then on either side. Using a pair of scissors make short cuts at the edges, about 4 in between the slits. I like the way its explained so clearly on this site. Take the cut and slit dough into your hand and pull it ever so gently on both sides to give that unique shape. Place it on the prepared tray. Make sure the slits are wide open otherwise they will fill up on fermenting. I also made another shape, like a flower. Roll one ball into a round shape. Make 5 cuts using a pair of scissors two third of the way, and in between each cut make a slit using a spatula. Got the idea from this site. Let the shaped dough rise for 30 to 40 minutes. I left mine for 40 minutes. Place the trays with the ferment bread into the oven and bake for 10 to 15 minutes or until the tops are light golden brown. Brush the tops with clarified butter or melted butter. Place the bread on a wire rack to cool a bit. Serve warm with a nice cup of coffee or tea. Make sure you make the slits wide enough. To make an eggless version add milk instead. I used about ½ cup of warm milk. Grate the cold butter, its so much easier using it to rub into flour. Got this tip while watching Micheal Smith work in his kitchen on telly. Can make one big flat shape either round or oval and make slits in the middle. delicious aromatic bread love it.